Okay, back to things non-related to food and coffee, even though those were a huge part of our trip. lol. 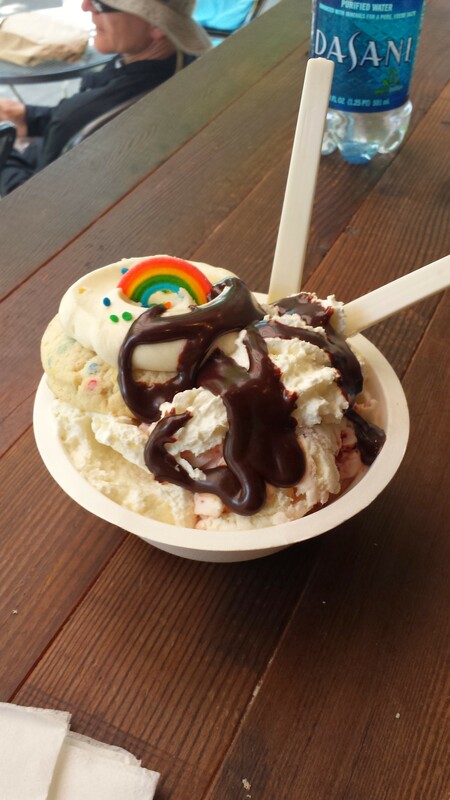 Like I said, there are tons of things to do in Seattle. For the purposes of 1)not making this a huge post and 2)keeping things organized, I’ll focus on things that we did in Seattle itself. 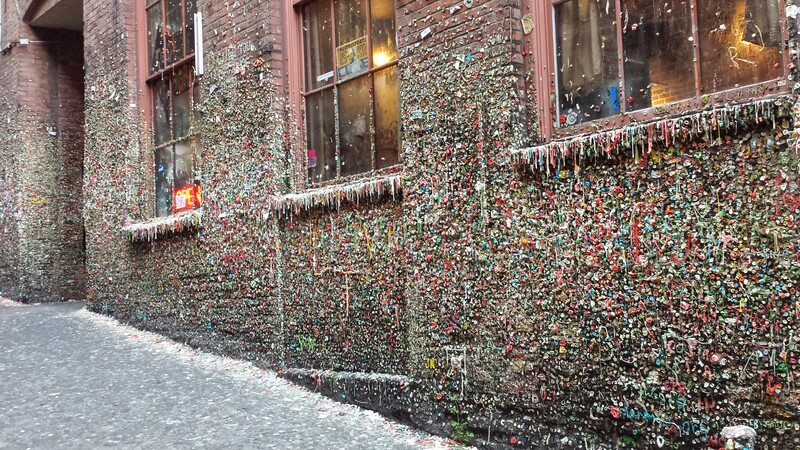 During out first night here, we stumbled across one of the more…gross things about Seattle, the gum wall. 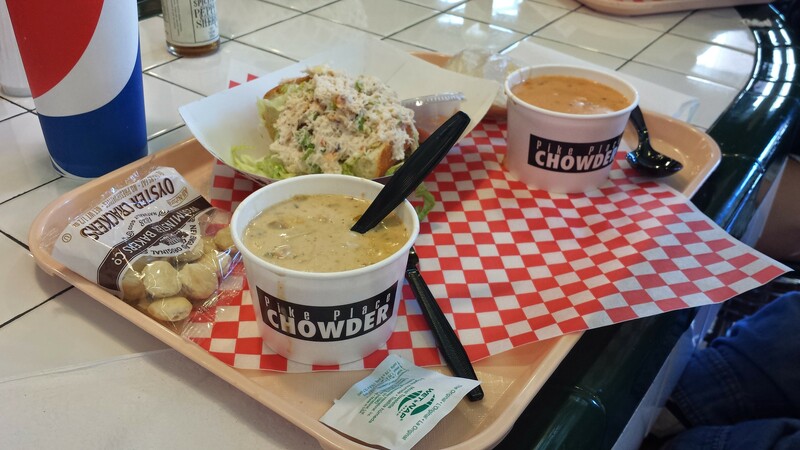 Now, I know what you’re thinking…freaking gross! 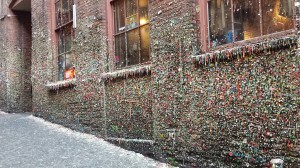 But, it’s something, that while completely unsanitary, you gotta at least go see if not do what we did and add our gum mark to the wall. Another site that we had on our list was going up in the Columbia Center to the 73rd floor. 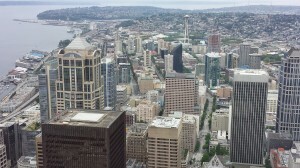 Now, so many people talk about having to go up in the Space Needle, and we did go see the outside of this, but the Columbia Center actually gets you higher and it way less crowded. I’m talking maybe 10 other people up there with you, whereas the Space Needle was insanely packed. 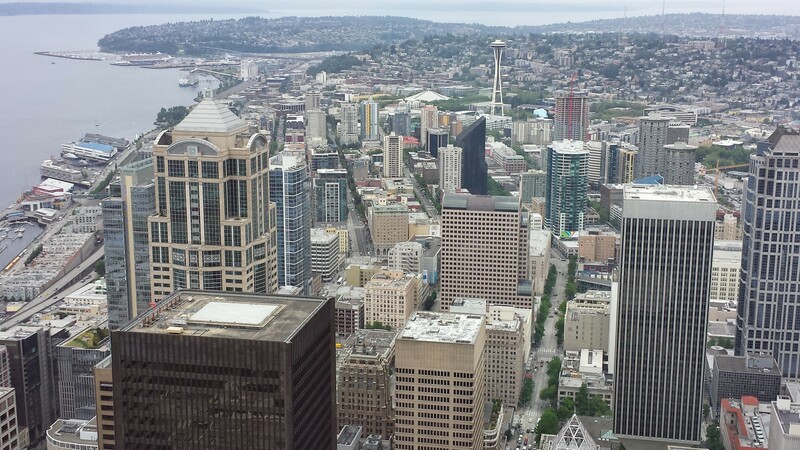 And, the Columbia Center was cheaper! Anyways, you must go up in one for the views…amazing! 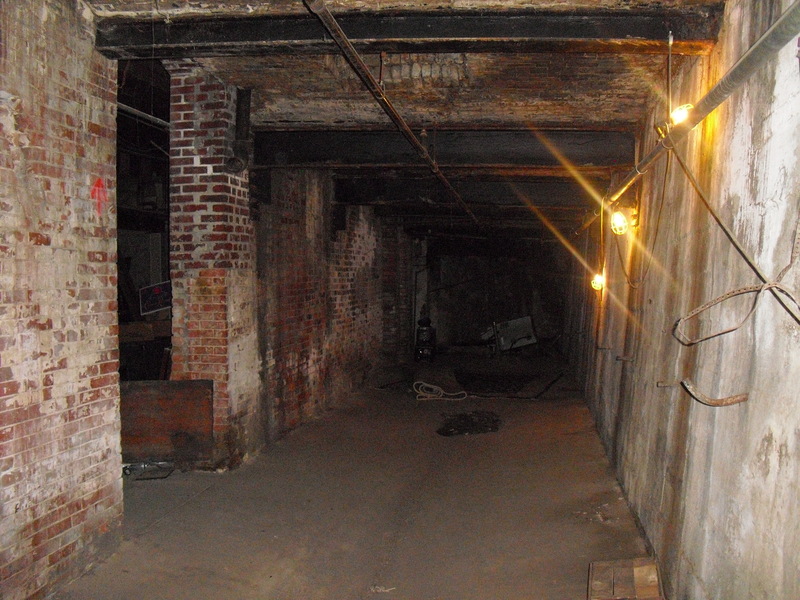 Another very cool experience we had was the Underground Tour. Most people (at least I’m assuming, since I had no idea) don’t know that when the Great Seattle Fire happened in 1889, they rebuilt the entire city up one story. 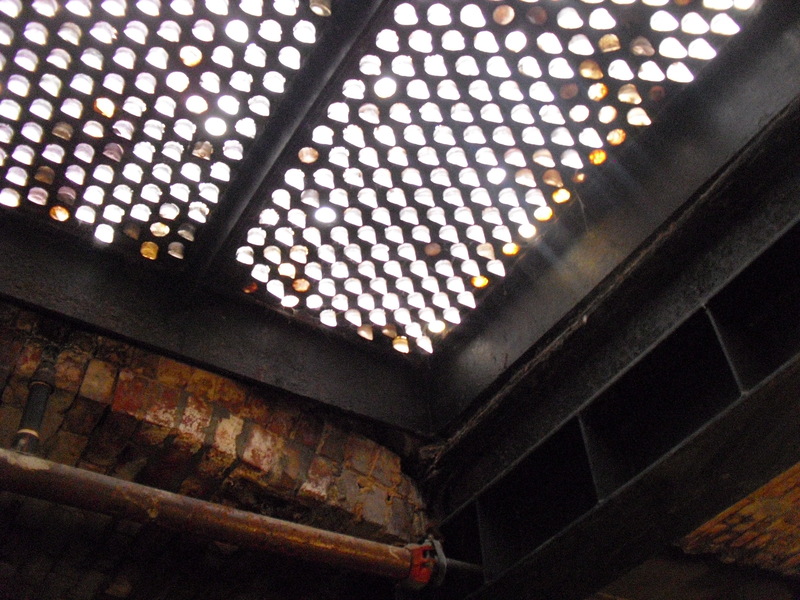 What was left was this underground city and there are still parts that are accessible today. 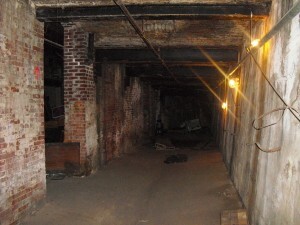 There are two companies that do this tour, and if you’re planning to do it, I highly recommend going with Beneath the Streets instead of Underground Tours. Again, this company is a little less know, meaning less people and more details, one-on-one tours. The next place we traveled was the Seattle Center. 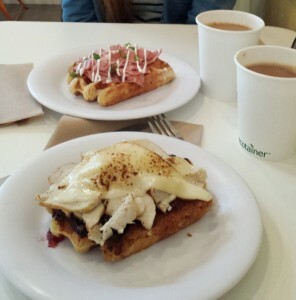 This area has tons of stuff, mainly touristy (Space Needle, for instance), but lots of food, museums, and the like. The Bill and Melinda Gates Foundation is also housed around this area, and this was a must on our list. 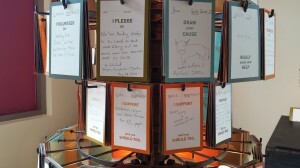 The center was an amazingly cool, interactive place where you were surrounded by inspirational sayings, pictures, etc. and you could learn a million things. I have to say, when we left I felt the most inspired than I have in my entire life. We also found a crop bag that was invented by students at Purdue University in order to keep out moisture and disease. So, Boiler Up all you IU fans! Cade and I were able to again leave our mark by taking our picture and writing about things that inspired us or that we supported. 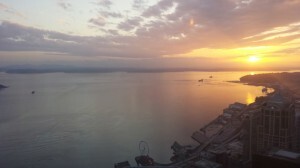 Okay, I already talked about the views at Columbia Center, but let’s say you are afraid of heights, or maybe you just don’t want to pay to get a view. Well, Kerry Park is another amazing place to get a view of the city without any cost or going up any tall buildings. It was a little bit of a walk for us, but there’s also buses if you don’t feel like trekking it (and I didn’t really that day, but Cade won). 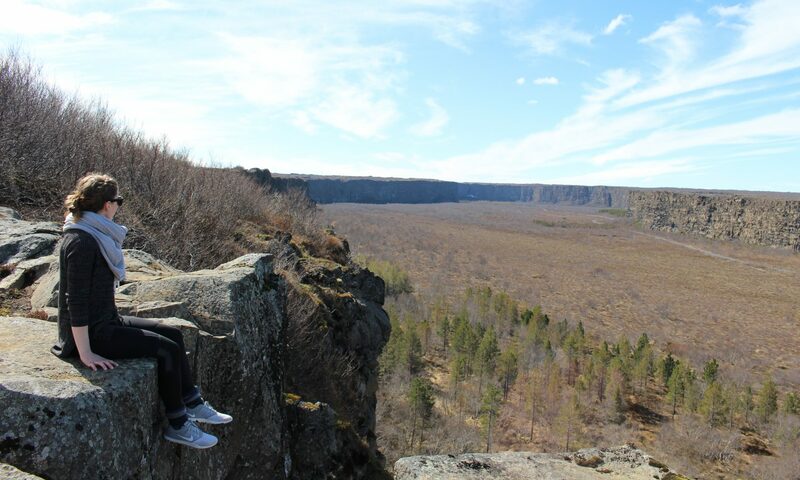 However you do it, the view is worth it! 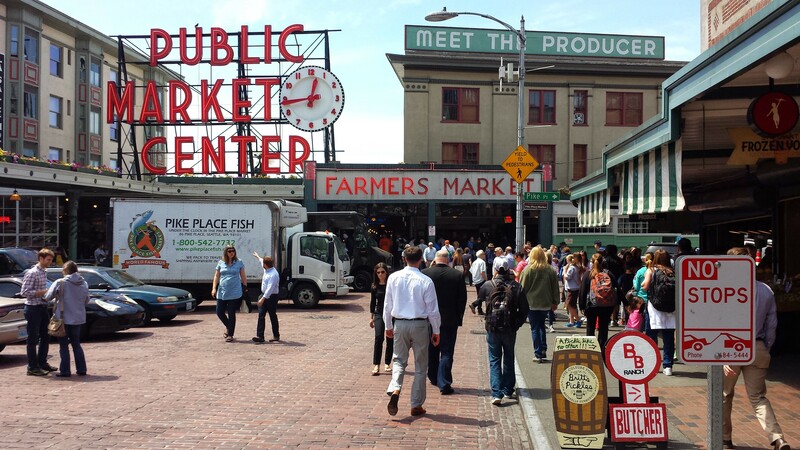 I’ll leave you with one of the obvious….the Pike Place Market! We had been by, around, and somewhat through the market before we actually spent time looking at everything on the last day. One thing about the market is that it is insanely crowded. 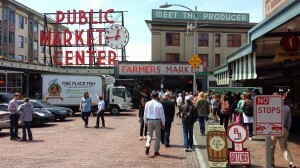 I feel sorry for the locals that attempt to do their regular shopping here, but of course, as tourists, we had to go! A little breakdown of the market: there are 6 floors!, so you could spend hours there if you allow yourself to, and there is just about anything you could imagine from flowers to fish to produce to comic shops to bead shops. 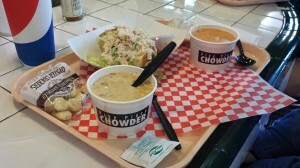 Unfortunately, we only saw one fish throwing (something the market is famous for), but we treated ourselves to some Chukar Cherries, chowder at Pike Place Chowder (totally worth the wait! ), a Gay sundae at the Cupcake Royale, and once again left our mark by placing a pin on Indiana on a map at one of the vendors.